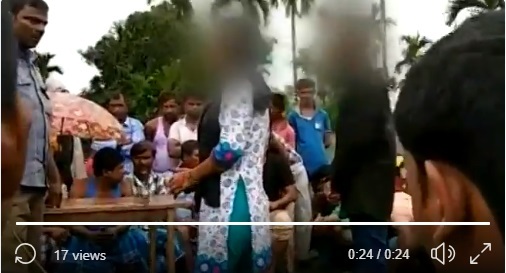 In what appeared to be akhappanchayat at best or at worst a cold-blooded kangaroo court, a video uploaded on social media, a couple was shown being mercilessly beaten up by a group of men while the entire spectacle was watched by dozens of people. Police sources said the disturbing incident took place at Simolitola village under Rongjuli police station in Western Assam’s Goalpara district. Some people made a video of the girl and her friend being tortured which has gone viral on social media. The video shows a youth mercilessly thrashed the girl with a bamboo stick as others looked on the incident. A case has been registered at Rangjuli police station in connection with the incident and police have arrested one accused in connection with the incident. The accused has been identified as Qurban Ali. Police believe that the assault on the woman and her companion is a case of moral policing. The incident follows another such incident in the district that came to light on April 9, when a woman was assaulted by a group of men when she was accompanying a male friend to a medical centre at Krishnai. At least 12 people were arrested in the case, in which the woman was assaulted for going out with a male friend. A 22-year-old woman, who is about to get married soon, was beaten up by local people after she was spotted with her friend at Aolguri area.